Having a positive attitude is like showing up to your team’s game ready to give it your best, excited and ready to go even if the chances of winning are low and it’s going to be hard work. You have good communication skills if you can listen well, you don’t swear at work or have a bad attitude, you can ask for what you want clearly and you’re not afraid to ask if you don’t understand something. Teamwork is just like when you’re playing netball or performing in your band. You help each other to get what you want, you make sure you do your part, you get on with everyone and you respect your coach or manager. When you manage yourself you are in control of what you do and say in a way that doesn’t harm yourself or others. You turn up to school or work on time, in the right clothes and ready to start, and people can rely on you. Willingness to learn is showing that you’re happy to learn new things and what you need to know to do your job. It also means that when, for example, your coach says that you need to work on your passes, or your kapa haka teacher says you need to improve your poi actions, you don’t get too upset, but take it calmly and try hard to do better. Using thinking skills means that if you see a problem, you don’t wait for someone else, you find a way to fix it. When you make a decision, such as what to do when you leave school, you think carefully about all your choices and ask for advice. Maybe you’ve worked really hard on that NCEA project and got a Not Achieved and feel like giving up? Or your family moves to a new town, away from your friends? Resilience is accepting that life does get hard at times and does change. It’s about being able to change, ask for help and keep going. You will have many of these skills already. The good news is that these skills can be learned in daily life. These posters show how you can gain employability skills through the activities you’re involved in. Three stories have been developed and there are poster templates for you to make your own. There are four activity sheets to use alongside the posters. Write or draw your own story to help you discover your employability skills. Literacy (being able to read and write) and numeracy (being able to do simple calculations and make sense of numbers) are the two most basic skills that employers look for. 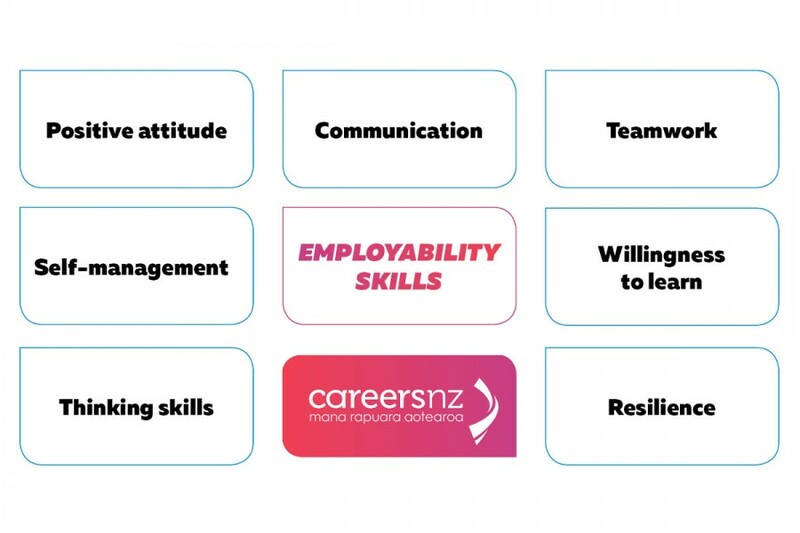 You can get help to improve these two skills from organisations such as Literacy Aotearoa. Most jobs need you to be able to use a computer. For example, plumbers write up invoices on tablets, retail assistants use computers to make sales, and street cleaners use email to send reports on floods. You can do free basic computing courses in your town. You can find these courses online or advertised at your local library or community centre. Having a driver's licence can give you an edge over candidates who don't have one. Many jobs involve driving – not just professional driving jobs such as bus driver, courier or truck driver. For example, caterers transport food to events, journalists drive to interviews and sales workers make deliveries.